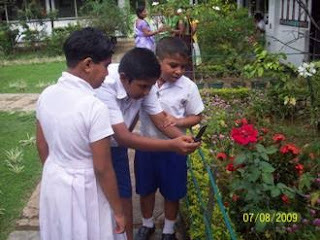 To learn about the diversity of leaves students have to pluck the leaves thus damaging the plants. A more interesting approach is where students collectively took photographs of leaves while observing them. Currently mobile phones are banned in Sri Lankan schools. But recently a research study on effectiveness of mobile phone for teaching and learning science was carried out in central province of Sri Lanka by a PhD student together with Department of Education of the University of Peradeniya in collaboration with the University of Bristol, UK. Dialog Telekom (a telecommunication company in Sri Lanka) supported this initiative by means of providing technical expertise and other resources. How will students use mobile phones if it is already banned in Sri Lankan Schools? In this study it was emphasized that a mobile phone can be just used as another science laboratory equipment such as a test-tube or a microscope. That would minimize the disciplinary and other related problems which caused to ban the mobile phones in Sri Lankan schools. Mobile phones are getting equipped with more advanced tools such as video cameras, audio/video players, etc. Also the handset prices are coming down day-by-day. So it is up to the users to use those for more productive purposes than destructive uses. I think teachers can educate pupils on how best they can use mobile technology even fulfilling basic human needs such as education rather than saying "no" to the new technology or trying to keep children away from the new technology. You can read more about the research study here. I'm not completely agree that this way of teaching is so useful!